Archaeology is the study of past human behavior. One way archaeologists study the past is by examining locations where people worked, played and lived. These are called archaeological sites. They can consist of a few pieces of chipped stone and a broken spear point (the prehistoric equivalent of a modern deer stand) or thousands of artifacts with hearths, storage pits and burials. Large or small all sites contain information about the past. Some are more important than others but they are all part of the story about life in the past. They are like pieces of a puzzle. Unfortunately, sites are destroyed everyday by modern development and urban sprawl and pieces of the puzzle are lost forever. Archaeological sites are non-renewable resources and once lost, the knowledge they contain will never be recovered. The Pennsylvania Historical and Museum Commission (PHMC) maintains a record of archaeological sites in the Commonwealth called the Pennsylvania Archaeological Site Survey (PASS) files. This is organized into a geographic information system based format. The information is used for research purposes but also to assist state and federal agencies in the management of sites that may be affected by their construction projects. Sites can be protected if they are recorded in the PASS files. The PASS files were first generated and are maintained by a group of committed individuals who enjoy the excitement of finding treasures from the past, but more importantly, are dedicated to the concept that archaeological sites are significant scientific laboratories that are essential to our understanding of the past (and managing our future). The PHMC has been systematically recording site locations since the 1950s. Until the files were consolidated in the 1980s, the Carnegie Museum assisted in the site recording process for the western most 17 counties. Much of the information has been submitted by members of the Society for Pennsylvania Archaeology, Inc and other amateur archaeologists but also interested landowners and state and federal agencies. The PASS files currently contain information on over 22,000 historic and prehistoric sites. This information has made a significant contribution to archaeological research and the protection and preservation of the Commonwealth’s archaeological heritage. In addition to those who are interested in the scientific data, many people collect artifacts, both from the historic and prehistoric periods, as a hobby. They simply enjoy collecting and displaying artifacts. When the farm fields are freshly plowed in the spring many hobbyists are excited about getting out and collecting” arrowheads” from their favorite fields. We frequently hear stories from people about their collection of spear points that they have accumulated over the years. With fond memories they recount the hours they spent with a father or friend collecting arrowheads. However, excessive surface collecting is slowing eroding the database of our past. Hobbyists, also, frequently trade, buy and sell artifacts. All too often, important excavation data is not included with the transfer of the artifact and unfortunately another piece of the puzzle will be lost from the scientific record. The archaeological community (both the professionals and the amateurs) have tolerated this type of activity because these hobbyists occassionally share their site locations and a small percentage of this data gets recorded. However, in the long run, the hobbyists who do not record this data with the PASS files, are doing more harm than good. Unfortunately, in recent years, it has become increasingly common for hobbyists to dig for artifacts. Scientific archaeological excavation focuses on the three dimensional mapping of artifacts and features within natural soil horizons. It is a complicated process. An archaeological excavation is a destructive process and it is necessary to collect as much data as possible to reconstruct the natural and cultural environment under which the artifacts were deposited. It can not be learned in a weekend or even in a summer. To understand and appreciate all of the intricacies of how to excavate a site requires years of training. The individuals who dig up artifacts are not systematically recording all the necessary information to evaluate the context. The artifacts they recover are practically worthless as scientific data. Digging for artifacts is simply looting. Even worse is the looting of artifacts on public land. This is stealing from the citizens of the Commonwealth. Under the State History Code, it is punishable by fines, imprisonment and the confiscation of all artifacts and equipment. For all citizens, the theft of our heritage can not be condoned. In 1992 the chance discovery of an artifact cache consisting of 80 pebble net sinkers was made by Les Kunkle, one of the museum’s active “Fort Hunter Dig” volunteers (Figure 1). Although the location, which is upriver from Harrisburg, yielded many prehistoric stone artifacts, the Late Archaic and Transitional periods seem to dominate, a finding that is not unusual for the lower section of the Susquehanna beyond Blue Mountain. Broadspears made from South Mountain metarhyolite of the Lehigh/Koens-Crispin type are common to the site as are the long and narrow stemmed bifaces of the slightly earlier Piedmont Archaic Period. Carved steatite kettle fragments and broken bannerstones which are also good time markers of the broadspear tradition are also present. It is important to point out that the net sinker cache was located in the “broadspear area of the site” suggesting that the association between the two artifact classes is likely more than sheer coincidence. Two lines of evidence suggest that this cache represents elements of a single net or a group of similar sized fishing nets—1) the context where they were found and 2) the general uniformity of individual net sinker’s size, shape and weight. Mr. Kunkle stated that “….the cache lay within a pocket of dark grayish soil about a foot in diameter that appeared pasty and organic….”. The dark soil matrix encapsulating the cache might indicate that the net sinkers were buried still attached to a casting net or other fishing device that subsequently rotted away over time. As seen above, each net sinker was bi-notched using a simple percussion method and shows little additional modification. There are no unusual differences noted in the types of lithic materials selected for these fishing components. The pebbles are of sedimentary origin comprised of medium coarse to fine grained sandstones and fine grained siltstones, brown, gray and purple in color, and river tumbled to form rounded to sub-rounded shapes. One is a fine grained platy shalestone which is a rock common to the valley’s water gaps. 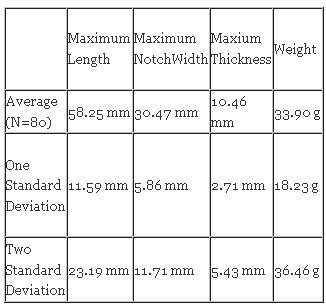 Sinker dimensions display a relatively tight range of measurements by category, seen particularly in the maximum thickness and maximum notch width data summarized in the table below. There is slightly more variability between net sinker length measurements which probably correlates to the increased variability in sinker weight and varying density of pebble lithic materials, although the data is not recorded in a way to make this comparison at present. 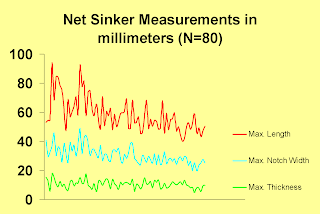 This aside, the low range of variation between net sinkers to some extent illustrates the care taken to gather uniform sized pebbles from the river shoals. The figure below presents the length/width/thickness measurements in millimeters of the pebble sinker cache (N=80). A rather consistent pattern is noted in the width at notch measurements taken at the narrowest point of each sinker. Statistically speaking, notch width measurements show a range of only 5.9 mm at one standard deviation and just over a centimeter within the 2-Sigma range. This means that roughly 68% of the net sinkers in this cache have a notch width ranging between 36.4-24.6 mm (~3.5-2.5 cm) and about 95% of the net sinkers in this cache have a notch width ranging between 42-19 mm (4.2-1.9 cm), with an average width of 30.5 mm (~3 cm). Could this tight range of notch widths correlate to the spacing distance between knots in the fishing net to which they were attached ? If so, this would suggest that the ropes of the net were spaced about 3 cm2 apart or at roughly 1.25 square inch intervals—a net that would most likely be used to catch large fish. Total weight of the cache is 2,715.3 grams - a dead weight of pebbles that after notched and attached to a net, might be more useful for bottom dragging (i.e. capturing foods such as mussels, eels, crayfish or other bottom feeding critters. We thank Mr. Kunkle for donating the net sinker cache to the State Museum of Pennsylvania where it is now curated and openly available for future study. What happens when staff members plant the gardens at historic sites managed by the Pennsylvania Historical & Museum Commission? It is likely that soil will produce an artifact. What is an artifact? An artifact is the physical evidence of past human behavior. To an archaeologist that evidence could be in the form of a stain in the soil, left behind from a hearth for cooking or from a stockade feature. Often that evidence is in the form of an object; a prehistoric projectile point, pottery, historic bottles, rusty nails, or stone tools are all links to past human behavior. This bit benefited from conservation treatment, insuring preservation for future generations. Now on display at Pennsbury Manor. Archaeological artifacts are not often “exhibit worthy”, but each fragment helps us to understand the daily activities and use of the buildings and grounds of the site. Distribution of fragments and the soil layers in which they are found provide archaeologists with information to recreate and understand past human behavior at a site. Since these fragments frequently don’t look “pretty”, as they are often broken and incomplete, they are put in back rooms on a shelf for “another day”. If they are lucky, someone places them in a bag or box with a note “mouth of groundhog hole in formal garden behind mansion next to sycamore tree”. Another day has come for some of these artifacts and they are receiving the attention they deserve. No longer are they waiting for someone to assign a catalog number to them so that their provenience, or location of discovery, will not be lost. At last they are being curated at The State Museum, Section of Archaeology; the proper repository for these orphans. Now they are accessible for a loan back to the historic site for display, or for other exhibits, as well as archaeology venues like the Pennsylvania State Farm Show. Orphaned artifacts are reunited with the collections at The State Museum recovered from formal excavations conducted on PHMC properties under the guidance of trained archaeologists. These centralized collections are a valuable resource for researchers studying a wide range of topics, for example the form and function of redware pottery or seeking evidence of skilled Moravian potters from Bethlehem in our 18th century historic sites. Perhaps it is for the Site Administrator that wants to know what the archaeological record could tell them about the foods consumed by the residents or the style of wine glass they drank from. 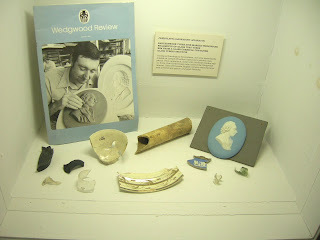 Exhibit at Joseph Priestly House of artifacts representing activities in the Priestly laboratory. The daily operations of our historic properties are often a challenging task. The resources are limited, but these sites continue to function offering a valuable resource to their surrounding communities both in educational opportunities and heritage. Now more than ever, stewardship of the archaeological resources as we move forward in placing properties under the care of volunteers and associate groups is increasingly important. Understanding the significance of the archaeological evidence left by those before us is crucial to the preservation of these properties. Maintenance tasks as simple as digging a hole to plant a tree are important to record, as are any artifacts unearthed with this activity. If the tree dies, evidence of the hole will still be evident in the soil, but the burden of figuring out when this occurred rests on the archaeological record. If documentation of this activity on site maps and document files is completed and the artifacts produced from this activity are properly curated, we can more readily identify areas for potential future excavations. Working diligently to educate the public about the importance of our heritage through public venues continues to be one of our major goals. Many of you enjoy the dugout canoe at Kipona Fest or at the Farm Show; some have viewed our exhibits and programs at the State Capitol or visited our gallery on the second floor of The State Museum. Preserving our cultural heritage is foremost in our mission and insuring that future generations are enriched through a better understanding of the past as represented not only in the written history but also in a well cared for archaeological record. Ceramic Disks: Children’s Play and Adult Gambling in Prehistoric Pennsylvania? Left Side: 17th Century Tin-glazed Disks from Contact Period Susquehannok Sites in Lancaster & York Counties. Small ceramic disks are found on Native American Woodland and Contact Period sites throughout Pennsylvania. These objects were manufactured by grinding broken pieces of fired Native or 17th Century Colonial pottery into circular shapes. In some cases one or two holes were drilled through their centers. It is possible that these artifacts were children’s toys and game pieces that were enjoyed by different Native groups throughout the Northeast. Whizzers or Buzzers are a traditional toy of both Native and European American children. Prehistoric whizzers were made from pottery, wood or bone, while metal whizzers are more commonly found in colonial contexts. They consist of a central disc, the whizzer, which is perforated with two holes. A string of sinew, twine or yarn is threaded through these holes and tied off to make a ring. By twisting the string and then pulling the ends out, the whizzer spins one way, and then twists back the other. This makes a whirring or buzzing noise when done correctly, for which the toy is named. Solid ceramic disks found in Pennsylvania are similar to game pieces associated with the bowl and dice game (Wa’lade hamma’gan) played by the Penobscot Indians of southern New England in the 1600s. It is also known as Hubbub after the “hub” “hub” chants of onlookers who wagered goods on each game’s outcome. In Hubbub, players’ would alternate turns, casting six small rocks, stone-fruit pits or pottery disks of different colored sides in a bowl. If five or six of the pieces land on the same color side during a turn, the player is awarded stick markers. Players accumulate markers of increasing value and attempt to win their opponents’ markers over the course of the game. While we cannot assume that this precise game was played by Pennsylvania Indians, games of chance are documented cross-culturally for many Native groups. Link here (www.nativetech.org/games) for a complete set of rules for the game of Hubbub and other examples of traditional Native American games. It’s that time of year again! Next weekend, April 9 – 11, marks the Society for Pennsylvania Archaeology’s 81St annual meeting. Hosted by the Westmoreland Chapter of the Society for Pennsylvania Archaeology (#23) this year the meeting will be held in beautiful Greensburg, PA, and the theme of the conference will be “Archaeology along Pa’s streams, rivers and hills”. As always, this year’s meeting promises to be enlightening and informative across a wide range of archaeological topics in the Keystone State. Presentations put forth by State Museum’s Section of Archaeology staff will include a recap of excavations and public outreach efforts conducted at Fort Hunter Park this past fall, and also an in depth analysis of 15th century burial practices, correlating ceramic typologies and the implications for cultural assimilation in the Lower Susquehanna Valley. Dr. Bernard K. Means will be the keynote speaker for Saturday evening’s banquet, discussing archaeological projects funded by the New Deal programs during the Great Depression era. More information on New Deal archaeology in Pennsylvania can be found here. The Society for Pennsylvania Archaeology was formed in 1929 by the Pennsylvania Historical Commission to promote the study of prehistoric and historic archaeological resources of Pennsylvania and neighboring states; to encourage scientific research. Avocational and professional archaeologists come together to learn about current research and preservation of archaeological sites and artifacts. The meeting, being held at the Four Points Sheraton in Greensburg is open to the public. Late registration at the hotel is $30. The Society is already one of our “favorite links” listed on the right hand side of the screen. For more information click the link to their homepage for the entire program including presentation abstracts.